You are currently browsing the archives for the Alamo category. Here’s a photo of the painted Texian Mounted Rifles. Actually they are simply mounted infantry, but for the Battle of San Jacinto they were used to represent mounted riflemen. I did encounter some problems with super-glued heads popping off during painting. So, my earlier claim to rely completely on “Quick Set” isn’t totally perfect. It has worked well in the past, so I suspect that mixing heads from different lines (HaT, Revell, Imex) also caused a mixing of types-of-plastics used to mold their figures. In the past I’ve done like-on-like and they don’t come off. So, to solve this problem I used a small hand drill (from MicroMark — get their catalog, they got great toys in there) and drilled out their necks, then pinned it using a strand from a nylon broom bristle. Glued in place, I drilled out the base of the head and slipped it into place. I still used Quick-Set to act as a gap filler, but I’m pretty sure these guys will never be losing their heads again! By the way, this was a lot easier than it sounds. I got big shaky hands and still managed to do this on the first try. Here’s the first batch of Texian Volunteer cavalry. You can see that the “top hats” from the Spanish Guerilla set are perfect. Big and distinct, and easy to grip with my jittery-fat-fingers. I used a drop of Super Glue on the body, and I dipped the head into a small puddle of INSTA-SET (which I’ve found at both local hobby shops as well as game stores). Hold the head in place for the count of ‘five’ and it is set. Seems to hold permanently, as I’ve yet to have a transplanted head come off from handling/ gaming. I’ve added some cactus from the Pegasus models terrain set (a great addition for any desert gaming, as the box has every variety of south western desert cactus I’ve ever seen, both large and small). I’ve used this on some of my Mexican infantry stands and it adds a lot of flavor. You’ll notice I based my cavalry one figure to a stand, mostly for ease of painting, but also for skirmish gaming. It’s easier to group them together as a unit when necessary, particularly b/c cavalry units in this period are pretty small. At five-to-one scale you can put six to ten cavalry figures together and call it a squadron, and that’s a large turn out for any of the battles of this period. Sure, the Mexicans did mass more cavalry as a whole, but they were so spread out as skirmishers and reconnaissance, having a few figures goes a long way. Currently I’m planning to make about ten Texian mounted figures, including a couple of them as leaders, since Sam Houstan famously got shot off a couple horses at San Jacinto (so I know he was mounted at least). Ideally I would like to represent Juan Seguin and his Tejano cavalry (about 30 men total, or six figures), but I’m not sure what cavalry figures to use as a starting point. They most likely had serapes like Mexican civilians, so that’ll have to wait I guess. Okay, so putting the Road Warrior aside for now (for finished pictures of games go to Flikr.com and search for Trialbyfiregames) I’m revisiting a period that I’ve enjoyed a lot: the war of Texan Independence, Alamo, etc. I got into this period using plastic HO scale figures b/c they are inexpensive, but look great. I found an article online that suggested that if you prime them in model-quality spray paint (such as Model Master’s Flat Black) they will not lose any detail, but the paint will also not flake off them (both true!). After playing with my army some I found that bayonets would lose paint and I began finishing my figures using Liquitex Matte Varnish (brushed on) to seal the paint. After that the plastic figures are as tough — or tougher — than metal figures. Anyhow, the new project is to create mounted Texian volunteers (yes, “Texian”, this is how they were referred to back in the day). Also, I am planning to make Mexican Presidial troopers. Both these VERY common troop types are not yet available in plastics, so I’m going to make some of my own. 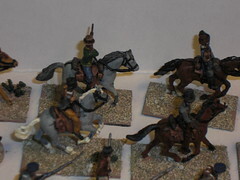 To start with I got Civil War cavalry as the base, and both the new Imex American Infantry and HaT’s Spanish Guerillas for heads. I also got another set of the Texan infantry for heads, but didn’t need them as much. While the Civil War cavalry have mostly shell jackets, I’m hoping that if I paint them in civilian colors, or as vests and shirts, they will still work fine as Texan Militia. As U.S. Army Dragoons (another spoke in the wheel of conversion that I’m planning) they are ideal. The same uniform, except w/o the riding boots. Hopefully when this is done I can do the battle of San Pasqual, which is THE local battlefield out here in San Diego. The American Infantry cap is perfect on the Imex figures and the heads are easily chopped off with an Xacto. Same for the “top hats” in the HaT set. They came with some badges and plumes on them, but those were easily cut off. Copyright © 2009 trialbyfiregames. All Rights Reserved.